My view. And it’s a pretty broad view, is that generally speaking Tortilla is Spanish and Frittata is Italian. The UK just has an omelette which doesn’t sound half as exciting. I had a green chilli omelette once in The Maldives for breakfast, that was quite exciting. When I am pondering about lunch I’ll often make use of the eggs in the fridge and pretty much whatever else is in there to knock up a quick Tortilla, I have a small cast iron skillet which is great when cooking for one or as a starter for two. However, when I am entertaining it becomes a Frittata because, even though using virtually the same ingredients and utensils, it simply sounds posher. 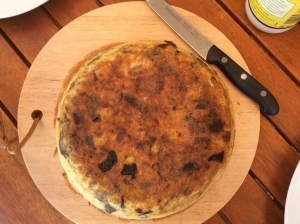 And below is a pic of an ‘all that was in the fridge’ Tortilla consisting of free range eggs, left over potatoes, red onion, black pepper, basil and olive oil. And you can call yours a tortilla, frittata, omelette, amelette, egg foo yung, omeleta or even a Hangtown fry… but remember it always tastes better having let it rest for 10 minutes. I had Tamagoyaki in Japan when there on business. It was a rice filled omelette served for breakfast. It just needed HP brown sauce but they couldn’t find any in my hotel! I simply love eggs! Omelette, tortilla, frittata whichever ways it comes.